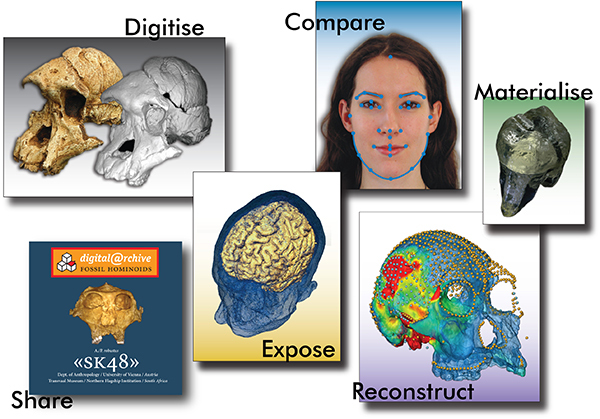 Virtual Anthropology (VA) is best characterized as a multidisciplinary approach to study anatomical data representations in 3D, particularly humans, their ancestors, and their closest relatives (other primates). Virtual Anthropology contributes to comparative and functional morphology. It exploits digital technologies and pools experts from different domains such as anthropology, primatology, medicine, paleontology, mathematics, statistics, computer science, and Engineering. Weber, G.W., Bookstein, F.L., 2011. Virtual Anthropology - A Guide to a New Interdisciplinary Field. Springer Verlag. ISBN 978-3-211-48647-4, Wien, New York.